What is the proper scope of macro and micro economics? Should they merely analyze standard monetary statistical data? Or should we measure an economy’s true value by monetizing vital economic factors such as unpaid household labor and the depletion of our natural resources? These are some of the many provocative issues raised by social scientist, activist and attorney Riane Eisler in her thoughtful new book, The Real Wealth of Nations: Creating a Caring Economics. Furthering the thesis begun in her 1987 bestseller, The Chalice and the Blade: Our History, Our Future, Eisler posits that society’s elevation of all things masculine to the subordination of the feminine has resulted in a male “dominator” mentality rather than a more feminine “partnership” orientation, which infects all aspects of our social order, including the realm of economics. With relevant statistics and cogent examples to bolster her theories, Eisler demonstrates that we need a more “caring economics.” The real wealth of nations should not be measured solely by conventional financial calculations, but rather should include the capital value of the natural environment and unpaid human resources, e.g., the contributions of caregivers. In The Real Wealth of Nations, Eisler argues that the actual economic foundation of every society is its reliance on unpaid labor by traditionally female household caregivers, but that conventional market-driven theories of economics measure only traditionally masculine production that results in an exchange of money, even if that production is nonessential or destructive. As a result, the essential work of caring and caregiving is unmeasured and therefore undervalued, despite the fact that the caring work of a mother in the United States is estimated to be worth over $100,000 per year. In fact, a 2004 Swiss government survey placed the value of the unpaid work in households at 70 percent of the reported Swiss Gross Domestic Product (GDP). With regard to skewed economics concerning the environment, Eisler cites the example of the multi-billion dollar cleanup cost of the 1989 Exxon Valdez oil spill. This debacle actually increased the United States GDP. But Eisler argues that the cleanup effort should be considered an economic liability, not an increase in production, since the billions of dollars were spent in an attempt to remediate the horrendous damage and pay litigation costs arising out of the spill. None of the environmental damage from the Valdez was reflected, nor could it be reflected, by any existing economic indicators and rules. Although Exxon’s financial statements did indicate its liabilities arising out of the spill, and the value of Exxon’s shares decreased as a result, the long term damage to the environment was not reflected in the GDP. Similarly, the GDP does not differentiate between “production” that is actually productive and “production”, such as the Valdez cleanup, that is at best remedial. The thrust of The Real Wealth of Nations is that valuing and measuring human resource capital is the best means of enhancing their productive capabilities and their profitability. Unlike other Western nations such as the Norse countries in which these principles have been successfully applied, the United States has no coherent humane policy for investing in its people— neither prenatal care, child care, education, nor care for our elderly. The concept of valuing human resource capital is a 21st century idea. In the eras of the serf, the farmer and the early assembly line worker, human resources were largely fungible. The skill needed was minimal and could be learned and performed by any willing body. As a consequence, human resources were not highly valued or respected. And unfortunately, our social and economic theory still reflects that limited, outmoded and uncaring bias. Eisler presents her ideas in a short informal style that is easy for the lay reader to digest. Her extensive footnotes and bibliography allow those who are interested to explore more deeply the research behind her thesis. The Real Wealth of Nations reads as though one were conversing with Eisler. In fact, I can testify to this, since I was fortunate enough to meet Riane Eisler when my husband and I attended her book launch gathering in San Francisco. She is a remarkable person and a stimulating speaker. Though Eisler can veer toward neo-feminist jargon from time to time, her call to reexamine economics from a broader perspective is persuasive and interesting. 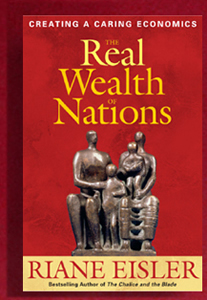 The Real Wealth of Nations is a thought-provoking clarion call for social and economic change.